A broad and inclusive definition defines implementation science as a systematic, scientific approach to ask and answer questions about how we get “what works” to people who need it, for as long as they need it, with greater speed, fidelity, efficiency, quality and relevant coverage. This definition allows for the application of at least ten research methods from a broad range of disciplines in order to understand and improve the determinants, processes, and outcomes of implementation and, ultimately, scale-up and sustainability to achieve population-level health benefits. While this selection of research methods is not exhaustive, together they provide a set of tools that are used to assess and improve implementation and scale-up of health interventions. 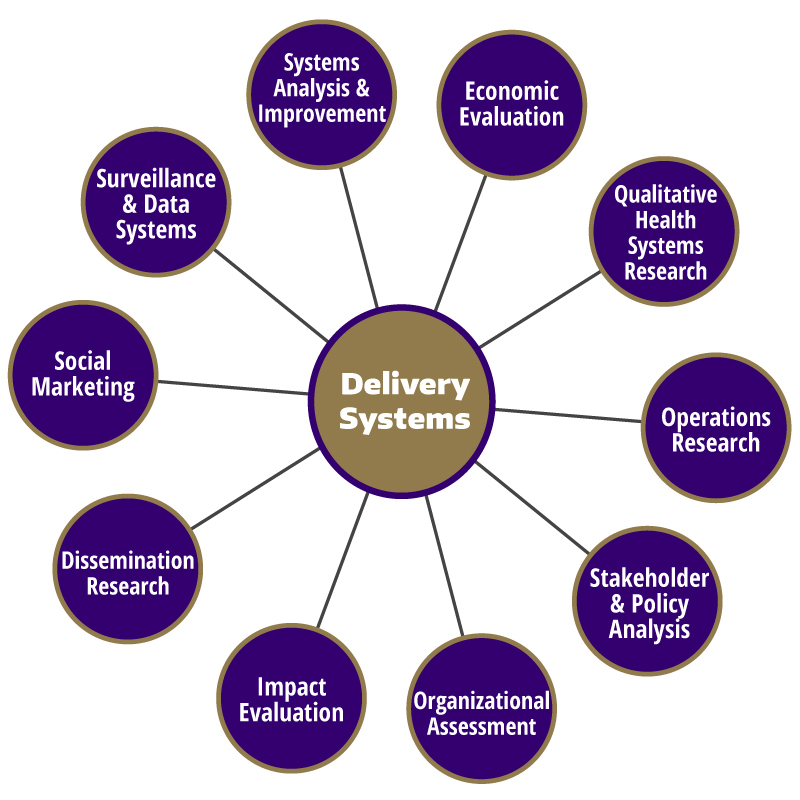 These methods allow exploration of the continuum consisting of three categories of outcomes: proximal implementation outcomes, such as acceptability, appropriateness, adoption, costs, feasibility, fidelity, penetration, and sustainability; intermediate service delivery outcomes such as efficiency, equity, timeliness, and patient-centeredness; and distal health outcomes. Definition: Routine surveillance data from control and experimental groups can be used illustrate the performance or impact of new policies and programs in an environment. Definition: The application of marketing principals to policy selection, as well as to implementation or intervention planning and operational delivery, done in a reflexive and critical manner. Definition: The targeted distribution of information and intervention materials to a specific public health audience or clinical practice audience. Definition: An evaluation of how the intervention or implementation affects relevant outcomes, intended or otherwise, and typically includes evidence of how outcomes would or would not differ in the absence of the intervention or implementation. What would have happened had the intervention not taken place? What was the impact of the intervention on beneficiaries? How does the outcome among beneficiaries compare to the outcome among individuals who were not involved in the program? Definition: Assessments that measure an organization's capacity, performance, culture, climate, readiness for implementation or change, external context, and/or social networks. Definition: The intentional integration of stakeholder perspectives and feedback in the analysis of policy advisability, execution and impact. Definition: The use of qualitative or quantitative models to facilitate decision-making in complex implementation, particularly relating to structure, prospective evaluation, and reconfiguration. What are the implementation problems exhibited by a particular project? What are the innovative solutions to deal with implementation problems? What policies or service delivery models can improve effectiveness or efficiency? What is the optimal allocation of resources for the program? Definition: Research that uses methods of observation and interviewing to evaluate health systems through the lens of those who experience them, and to explain factors that shape outcomes, dimensions of care, as well as the social and political determinants of health. Definition: Monetary-focused assessments evaluating system efficiency and allocation of resources to implementations, interventions, or services.